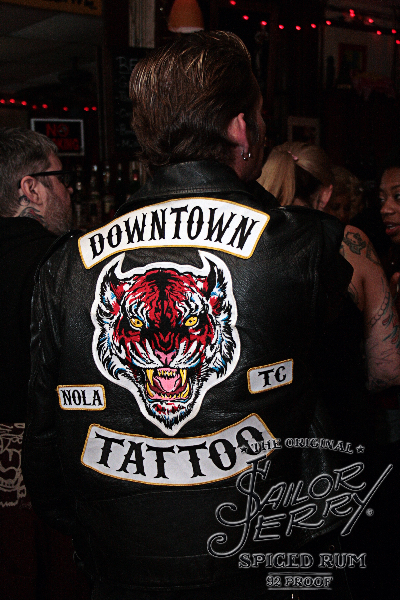 Downtown Tattoos opened its doors to Frenchmen Street in June of 2012. The shop is owned by Terry Brown, a seasoned artist that has over 11 years of experience tattooing all across the country, along with his lovely wife Hayley Waldner, who is also the Sailor Jerry Rum ambassador for the state of Louisiana. Besides sharing a passion for tattoo, Terry and Hayley are entrepreneurs at heart, and they jumped at the chance to create the optimal tattoo experience when the corner space on Frenchmen St. became available. In Downtown Tattoos, Hayley and Terry have created an atmosphere that makes one feel as though the shop has been around forever. They are heavily involved with their community, and they love to hold fun events (like Toys for Tats) to help them connect with and contribute to the people and causes around them. A classic tattoo parlor with an eclectic twist, the shop has lit up this corner of Frenchmen with its unique culture, local artistry, and creative vibe. Whether you have a sleeve of tattoos or none, Downtown’s welcoming attitude and positive energy will make you feel right at home.